Only one national park in the country includes and protects a section of historic Route 66: the Petrified Forest National Park with one of the world’s largest and most colorful concentrations of petrified wood, multi-hued badlands of the Painted Desert, historic structures, archeological sites, and displays of over 200-million-year-old fossils. The national park and this section of Route 66 are not to be missed, and one of the most special places to visit in the park is the Painted Desert Inn. 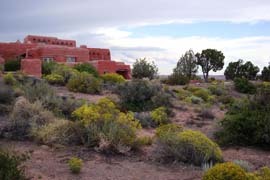 The inn is situated on a mesa overlooking the vast and colorful Painted Desert. It is rooted in a lodge that entrepreneur Herbert David Lore completed around 1920. In 1935, the National Park Service purchased the inn and its surroundings. The National Park Service immediately began planning to overhaul the building using the rustic aesthetic so popular in park architecture of the time. The National Park Service commissioned Lyle Bennett, one of its most sought-after architects, for the remodeling. Young men employed in the Civilian Conservation Corps, one of the Franklin D. Roosevelt administration’s back-to-work programs, supplied the labor. The inn is of wood and native stone in the Pueblo Revival style. Outside, flagstone terraces surrounded by low walls overlook the desert. The building’s stone walls are more than two feet thick and finished with textured earth-toned stucco. Multiple flat roofs with parapets give the inn its varied massing, and Ponderosa Pine logs pierce the walls, adding play between light and shadow. One construction foreman noted the importance of the building’s details. Its openings, for instance, had semi-oval shapes rather than right-angled edges. He commented that: "This shape was produced in the rock and plaster to resemble the openings in old pueblo buildings where the wet adobe was shaped by the sweeping motions of the women's arms that shortened the horizontal width of the opening at the top and bottom. Consider the difficulty of teaching a journeyman mason to understand…After much arm waving they got the message and were able to proceed.” That same foreman recalled how the concrete floors, walls, and furniture made the whole interior glow with soft, blended coloring. 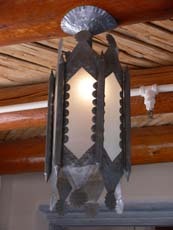 The CCC used ponderosa pine and aspen poles from Arizona forests for the vigas or roof beams and crafted handmade light fixtures from tin and wooden tables and chairs with American Indian designs. The concrete floors in the dining room and viewing porch had etched and painted patterns from Navajo blanket designs. The inn opened in 1940 under the management of the Fred Harvey Company, which was famous in the Southwest for providing hospitality services to tourists and travelers on the Santa Fe Railroad. For two years, the inn offered Route 66 travelers food, souvenirs, and lodging, and local people with event and meeting space. It closed in 1942, as American involvement with World War II shifted resources away from domestic programs. In 1947, the Harvey Company’s noted architect and interior designer, Mary Jane Colter, was given responsibility for renovations of the facility. Along with overseeing repair work, Colter created a new interior color scheme and made other changes. New plate glass windows to capitalize on the magnificent surrounding landscape were an important addition. At Colter’s behest, Hopi artist Fred Kabotie painted murals on the dining room and lunchroom walls that are reflections of Hopi culture. The Harvey Girls provided their legendary service to the public at the Painted Desert Inn. Even so, over the next decade, the inn declined and suffered from structural damage. In 1963, the inn closed and a new facility opened to house the park visitor center and the Fred Harvey operations. The park scheduled the building’s demolition in 1975, but a public campaign helped save the building, which the National Park Service listed in the National Register of Historic Places in 1976. The Secretary of the Interior recognized the historic significance of the inn by designating it a National Historic Landmark in 1987. 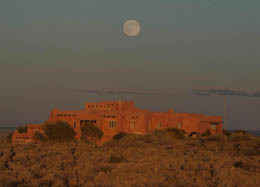 In 2006, the Painted Desert Inn reopened following its restoration. The inn now appears as it would have in 1949. Today, visitors again are able to experience the exquisite architectural details and richly colored walls of the Painted Desert Inn. Some highlights include the Trading Post Room, a magnificent architectural space with six hammered-tin, Mexican-style chandeliers, an enormous skylight, and windows overlooking the desert. The skylight has multiple panes of translucent glass painted in Indian pottery designs. The posts supporting the corbels and vigas are painted in muted colors. The inn still has the original Fred Kabotie murals. A large and stunning mountain lion petroglyph is on display inside the inn. Discovered in the 1930’s, the petroglyph is considered one of the finest, most vividly animated and lifelike depictions of mountain lions in the region. The Painted Desert Inn is located in the northern section of Petrified Forest National Park in Petrified Forest, AZ. It has been designated a National Historic Landmark. Click here for the National Historic Landmark registration file: text and photos. The inn is now a museum open Monday-Sunday 9:00am to 5:00pm every day except Christmas. Guided tours are also available with special Halloween tours that focus on the purported ghosts said to haunt the inn. Times vary from season to season. The park has an entrance fee but no additional fee is charged to visit the inn. Call 928-524-6228 for more information on visiting Petrified Forest National Park and the inn or go to the park website , or visit the park’s Painted Desert Inn website or call the inn directly at 928-524-3522. The Painted Desert Inn has been documented by the National Park Service’s Historic American Buildings Survey.